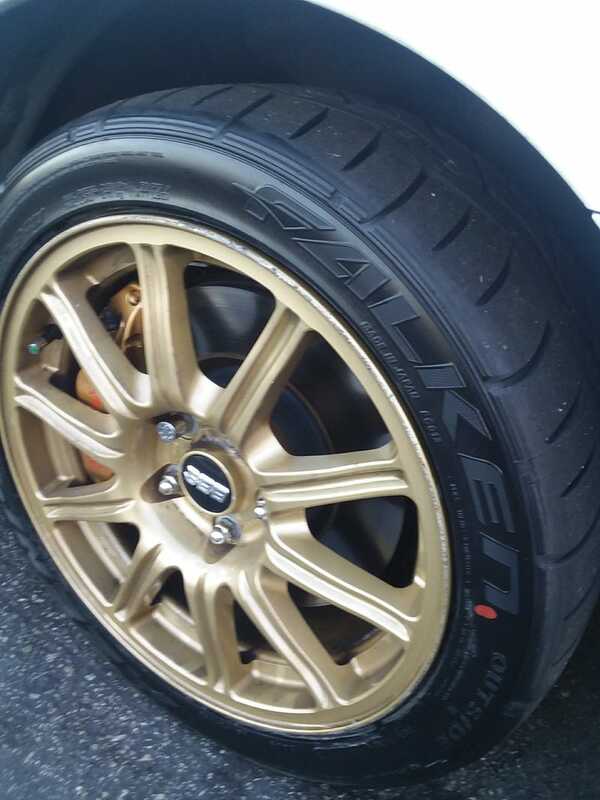 On Saturday I finally got to my local America’s Tire and had a set of Falken 615k+ tires installed on my ‘06 STi. The car was long overdue for tires since they were past the wear bars and rode kind of rough at higher speeds. Plus they were cheap no season tires anyways so I was happy to be rid of those. My quest was to find an affordable summer tire that would maximize grip during all of my canyon runs commuting to and from work. My first thought was a higher treadware summer tire (like the Direzza DZ102 I have on the Miata) but then I found the Falkens. These are an entry level 200 TW tire, meaning much more grip but also much less tire life than some 300+ TW other tires. However, these also do not come along with the $150+ price tag that your Hankook RS4, Direzza Star Specs, or Bridgestone RE71R would go for. These were $121 a piece and came out to a grand total of $609.74 installed and with all of the taxes/fees. Not too bad for a 225/45/R17 tire. Now my impressions so far are that these are VERY good tires. I have not really had a “good” street tire before. The DZ102 on my Miata are “acceptable” and perform like a summer tire should. But they are in no way “grip monsters” or anything like that. I have experience with 100TW tires for autocross, but that is of course more intense than any street driving will be (remotely close to legally/safely at least). Anyways, the Falken 615k+ tire on the Subaru instantly made the car grip ALL the time. I knew with real tires I could finally push the car and so my commute home on Monday was quite exciting. I took the entirety of Mulholland Highway and finally found that understeer at the limit in this car around the tightest of turns. Having actual tires is much more confidence inspiring and makes the car quite more playful. I have found that generally more grip in the Miata makes it less playful while with this car, I really dont want to be sliding around so more grip = more fun. In the near future, I hope to be able to run an Autocross event or two with this car just to REALLY test out the tires and the car in general. But realistically that duty will be kept to the Miata so I need tires for that car as well. That can wait until after ski season though since I need to shift spending focus onto that activity. I still need another set of wheels, snow tires, ideally a roof rack and ski rack, and maybe a set of tire chains but those should be unecessary with the AWD and snow tire combo. I am assuming I would run out of ground clearance before those are useful.